Here's the BottleRock festival grounds map that was posted tonight. The Cure play the Toshiba Stage from 7:30 - 10pm on May 30th. The Cure returns after a five-year hiatus to headline this year's BottleRock Napa festival alongside Outkast and Eric Church. The British band has been making up for the lost time with its recent marathon sets, which cover everything from the hits ("Just Like Heaven," "Pictures of You," and so on) to deep, deep cuts. Robert Smith, the group's 55-year-old front man, known for smeared lipstick and gravity-defying locks, tells us why every set still matters. Q: You have been playing four-hour shows. Where do you get the energy? A: Well, I'm not known for my onstage gymnastics. Q: I know, but you've written so many songs. How do you remember them all? A: A lot of the songs are just embedded in me. If I get the first line to any Cure song, I can just sing the rest. But I do believe you should be feeling the words you're singing. Q: Is it difficult to get in the headspace of your 19-year-old self? A: I remember who I was when I wrote (the songs), which is good enough. Sometimes at the end of a song it's like coming out of a weird trance. I go right back in time to when we first started performing and the joy and excitement we had when the lights went down. Q: How has being in the Cure for so long affected your personal life? A: Well, I suppose when we started to get really well known, in the mid-'80s, that was a strange period for me. But I wouldn't swap the experience. I did think that when I was 55 I wouldn't have to deal with people camping in my drive, but that isn't the case. Q: Did you read the Morrissey autobiography? A: Strangely enough, no. I haven't got to that one yet. There are about 101,000 other books I would like to read first. Q: I figured there might be some shared experience there. A: I doubt we have a shared experience. I'm not interested in reigniting a feud, but I don't think our approach to life has been similar in any way. I don't read biographies. I'm more interested in fiction. Q: Will you ever write one? 3. That said, festival headliner the Cure are making their first Northern California appearance in six years, and their only U.S. live date this year until September. This could be the last time Robert Smith's hair appears in Napa. They're also hiding some 3 day passes around various California cities. Follow them on Instagram for hints on where to find them. Also, listen to Live 105 all this week at 8PM, and all weekend, to win passes. Musical Encounter with The Cure on May 29th! From Live105 on Instagram: "hit up http://LIVE105.com this weekend to enter for chance to get into a SECRET SHOW with THE CURE." Update (05/22/14): @AaronAxelsen just confirmed that the secret show will be next Thursday, May 29th. And he says it will be an "intimate" show. Update (05/23/14 1:37pm): LIVE105 just said the Secret Show will be a private BottleRock rehearsal only open to 7 people. 7! Win tickets from them starting at 3pm today. Yeah, good luck with that! It needs to be stressed that this is NOT going to be a "secret show". As in a full Cure show. Think soundcheck level type of show. Live105 messed that announcement up. Still, will be nice to attend it. And here are the details. For those of you going to the Denver Riot, they've posted shuttle info for you. You can take it from Denver, Boulder, or Fort Collins. For those headed to the Chicago Riot, they've posted info on locker rentals. They've also posted hotel info for all Riots, but unless I'm missing something, it's just Booking.com links, no special discounts or packages. "Graham said the tipping point for the festival came at a meeting with a Los Angeles-based William Morris music executive named Marc Geiger. “We flew down there, and we told him our story,” said Graham. “Who we were. Our intentions. Our background.” In the end, “He let us give them our money,” said Graham with a laugh. The producers ended up booking all-important headliners Outkast and Eric Church through Geiger, Graham said. The Cure was a last-minute, but “much welcomed,” addition, and just in time to announce the entire lineup, he said." 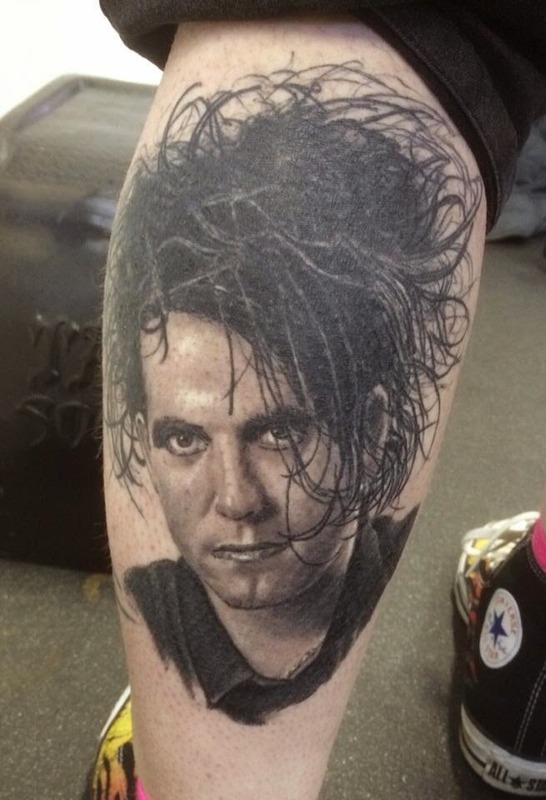 Added new tattoos from Hayley Jane and Melanie G. to the Cure Tattoo Gallery. From Reverend Guitars on Facebook: "Reeves Gabrels has an album coming out with Bill Nelson, called Fantastic Guitars!" Is 'Just Like Heaven' The Cure's best song? The set times have been posted. The Cure get 2 & 1/2 hours! Will play from 7:30 - 10pm on the Toshiba stage.